One of the world’s largest and strongest economies. With the nest intelligence services, the bravest armed forces, the most effective hard and soft power, and friendships, partnerships and alliances in every continent. The people of the United Kingdom (UK) have voted to leave the EU and this Government will respect their wishes. We will trigger Article 50 of the Treaty on European Union by the end of March 2017 to begin the process of exit. We will negotiate the right deal for the entire UK and in the national interest. With our economy proving resilient, the UK enters these negotiations from a position of strength. We approach these negotiations from a unique position. As things stand, we have the exact same rules, regulations and standards as the rest of the EU. Unlike most negotiations, these talks will not be about bringing together two divergent systems but about managing the continued cooperation of the UK and the EU. The focus will not be about removing existing barriers or questioning certain protections but about ensuring new barriers do not arise. The links between the UK and the rest of Europe are numerous and longstanding – and go beyond just the EU. They range from our shared commitment to NATO to the shared values underpinning our societies, such as democracy and the rule of law. The UK wants the EU to succeed. Indeed it is in our interests for it to prosper politically and economically and a strong new partnership with the UK will help to that end. We hope that in the upcoming talks, the EU will be guided by the principles set out in the EU Treaties concerning a high degree of international cooperation and good neighbourliness. In this paper we set out the basis for these 12 priorities and the broad strategy that unites them in forging a new strategic partnership between the United Kingdom and the EU. We have respected the decision of Parliament that we should not publish detail that would undermine our negotiating position. However, we are committed to extensive engagement with Parliament and to continuing the high degree of public engagement which has informed our position to date. We will continue to engage widely and seek to build a national consensus around our negotiating position. The referendum result was not a vote to turn our back on Europe. Rather, it was a vote of confidence in the UK’s ability to succeed in the world – an expression of optimism that our best days are still to come. This document sets out our plan for the strong new partnership we want to build with the EU. Whatever the outcome of our negotiations, we will seek a more open, outward-looking, con dent and fairer UK, which works for all. We recognise how important it is to provide business, the public sector and the public with as much certainty as possible. So ahead of, and throughout the negotiations, we will provide certainty wherever we can. We will provide as much information as we can without undermining the national interest. 1.2 This approach will preserve the rights and obligations that already exist in the UK under EU law and provide a secure basis for future changes to our domestic law. This allows businesses to continue trading in the knowledge that the rules will not change significantly overnight and provides fairness to individuals whose rights and obligations will not be subject to sudden change. It will also be important for business in both the UK and the EU to have as much certainty as possible as early as possible. 1.3 Once we have left the EU, Parliament (and, where appropriate, the devolved legislatures) will then be able to decide which elements of that law to keep, amend or repeal. 1.4 We will bring forward a White Paper on the Great Repeal Bill that provides more detail about our approach. 1.5 Domestic legislation will also need to reflect the content of the agreement we intend to negotiate with the EU. First, it will repeal the European Communities Act 1972, and in so doing, return power to UK politicians and institutions. Second, the Bill will preserve EU law where it stands at the moment before we leave the EU. Parliament (and, where appropriate, the devolved legislatures) will then be able to decide which elements of that law to keep, amend or repeal once we have left the EU – the UK courts will then apply those decisions of Parliament and the devolved legislatures. Finally, the Bill will enable changes to be made by secondary legislation to the laws that would otherwise not function sensibly once we have left the EU, so that our legal system continues to function correctly outside the EU. The Government’s general approach to preserving EU law is to ensure that all EU laws which are directly applicable in the UK (such as EU regulations) and all laws which have been made in the UK, in order to implement our obligations as a member of the EU, remain part of domestic law on the day we leave the EU. In general the Government also believes that the preserved law should continue to be interpreted in the same way as it is at the moment. This approach is in order to ensure a coherent approach which provides continuity. It will be open to Parliament in the future to keep or change these laws. 1.6 We will continue to build a national consensus around our negotiating position by listening and talking to as many organisations, companies and institutions as possible. Government ministers have led widespread engagement with their sectors and ministers from the Department for Exiting the EU alone have held around 150 stakeholder engagement events, covering all sectors of the economy. The majority have been outside London and right across the UK, including Scotland, Wales, Northern Ireland and England. This has helped inform Government understanding of the key issues for business and other stakeholders ahead of the negotiations. This engagement will continue throughout the period before we leave. 1.7 The devolved administrations will continue to be engaged through the Joint Ministerial Committee (JMC), chaired in plenary by the Prime Minister and attended by the First Ministers of Scotland and Wales and the First and deputy First Ministers of Northern Ireland, and the JMC sub-committee on EU Negotiations (JMC(EN)), chaired by the Secretary of State for Exiting the European Union, with members from each of the UK devolved administrations. 1.8 Parliament also has a critical role. First, legislation will be needed to give effect to our withdrawal from the EU and the content of such legislation will of course be determined by Parliament. This includes the Great Repeal Bill, but any significant policy changes will be underpinned by other primary legislation – allowing Parliament the opportunity to debate and scrutinise the changes. For example, we expect to bring forward separate bills on immigration and customs. There will also be a programme of secondary legislation under the Great Repeal Bill to address deficiencies in the preserved law, which will be subject to parliamentary oversight. That programme of debates will continue. 1.10 The Government has made five Oral Statements to Parliament on the subject of the UK’s withdrawal from the EU and answered over 500 Parliamentary Questions. Ministers from the Department for Exiting the EU have also appeared 12 times in front of select committees, and those committees have undertaken, or are currently undertaking, 36 inquiries on EU exit-related issues. Government ministers will continue to provide regular updates to Parliament and the Government will continue to ensure that there is ample opportunity for both Houses to debate the key issues arising from EU exit. 1.11 To enable the Government to achieve the best outcome in the negotiations, we will need to keep our positions closely held and will need at times to be careful about the commentary we make public. Our fundamental responsibility to the people of the UK is to ensure that we secure the very best deal possible from the negotiations. We will, however, ensure that the UK Parliament receives at least as much information as that received by members of the European Parliament. 1.12 The Government will then put the final deal that is agreed between the UK and the EU to a vote in both Houses of Parliament. 1.13 We recognise the importance to business of having certainty about funding arrangements over the coming years. We have already acted quickly to give clarity about farm payments, competitive grants, including science and research funding, and structural and investment funds. All European Structural and Investment Funds (ESIFs) projects signed, or with funding agreements that were in place before the Autumn Statement 2016, will be fully funded, even when these projects continue beyond the UK’s departure from the EU. This includes agri-environment schemes under the Common Agricultural Policy (CAP). For projects signed after the Autumn Statement 2016 and which continue after we have left the EU, HM Treasury will honour funding for projects if they provide strong value for money and are in line with domestic strategic priorities. For bids made directly to the Commission by UK organisations (including for Horizon 2020, the EU’s research and innovation programme and in funds for health and education), institutions, universities and businesses should continue to bid for funding. We will work with the Commission to ensure payment when funds are awarded. HM Treasury will underwrite the payment of such awards, even when specific projects continue beyond the UK’s departure from the EU. HM Treasury has also provided a guarantee to the agricultural sector that it will receive the same level of funding that it would have received under Pillar 1 of CAP until the end of the Multiannual Financial Framework in 2020. In the case of the devolved administrations, we are offering the same level of reassurance as we are offering to UK government departments in relation to programmes they administer, but for which they expected to rely on EU funding. The Government will consult closely with stakeholders to review all EU funding schemes in the round, to ensure any ongoing funding commitments best serve the UK’s national interests. We will take control of our own affairs, as those who voted in their millions to leave the EU demanded we must, and bring an end to the jurisdiction in the UK of the Court of Justice of the European Union (CJEU). 2.1 The sovereignty of Parliament is a fundamental principle of the UK constitution. Whilst Parliament has remained sovereign throughout our membership of the EU, it has not always felt like that. The extent of EU activity relevant to the UK can be demonstrated by the fact that 1,056 EU-related documents were deposited for parliamentary scrutiny in 2016. These include proposals for EU Directives, Regulations, Decisions and Recommendations, as well as Commission delegated acts, and other documents such as Commission Communications, Reports and Opinions submitted to the Council, Court of Auditors Reports and more. 2.2 Leaving the EU will mean that our laws will be made in London, Edinburgh, Cardiff and Belfast, and will be based on the specific interests and values of the UK. In chapter 1 we set out how the Great Repeal Bill will ensure that our legislatures and courts will be the final decision makers in our country. 2.3 The Court of Justice of the European Union (CJEU) is the EU’s ultimate arbiter on matters of EU law. As a supranational court, it aims to provide both consistent interpretation and enforcement of EU law across all 28 Member States and a clear process for dispute resolution when disagreements arise. The CJEU is amongst the most powerful of supranational courts due to the principles of primacy and direct effect in EU law. We will bring an end to the jurisdiction of the CJEU in the UK. We will of course continue to honour our international commitments and follow international law. 2.4 We recognise that ensuring a fair and equitable implementation of our future relationship with the EU requires provision for dispute resolution. 2.5 Dispute resolution mechanisms ensure that all parties share a single understanding of an agreement, both in terms of interpretation and application. These mechanisms can also ensure uniform and fair enforcement of agreements. 2.6 Such mechanisms are common in EU-Third Country agreements. For example, the new EU-Canada Comprehensive Economic and Trade Agreement (CETA) established a ‘CETA Joint Committee’1 to supervise the implementation and application of the agreement. Parties can refer disputes to an ad hoc arbitration panel if necessary. The Joint Committee can decide on interpretations that are binding on the interpretation panels2. Similarly, the EU’s free trade agreement with South Korea also provides for an arbitration system where disputes arise3. 2.7 Dispute resolution mechanisms are also common in other international agreements. Under the main dispute settlement procedure in the North American Free Trade Agreement (NAFTA), the governments concerned aim to resolve any potential disputes amicably, but if that is not possible, there are expeditious and effective panel procedures. Similarly, under the treaties establishing Mercosur, disputes are in the first instance resolved politically, but otherwise the parties can submit the dispute to an ad hoc arbitration tribunal. Decisions of the tribunal may be appealed on a point of law to a Permanent Review Tribunal Under the New Zealand-Korea Free Trade Agreement, where the focus is also on cooperation and consultation to reach a mutually satisfactory outcome. The agreement sets out a process for the establishment of an arbitration panel. The parties must comply with its findings and rulings, otherwise compensation may be payable or the benefits of the FTA may be suspended. Within the World Trade Organisation (WTO), the Dispute Settlement Body (made up of all the members of the WTO) decides on disputes between members relating to WTO agreements4. Recommendations are made by dispute settlement panels or by an Appellate Body which can uphold, modify or reverse the decisions reached by the panel. Such mechanisms are essential to ensuring fair interpretation and application of international agreements. 2.8 The UK already has a number of dispute resolution mechanisms in its international arrangements. The same is true for the EU. Unlike decisions made by the CJEU, dispute resolution in these agreements does not have direct effect in UK law. 2.9 As with any wide-ranging agreement between states, the UK will seek to agree a new approach to interpretation and dispute resolution with the EU. This is essential to reassure businesses and individuals that the terms of any agreement can be relied upon, that both parties will have a common understanding of what the agreement means and that disputes can be resolved fairly and efficiently. 2.10 There are a number of examples that illustrate how other international agreements approach interpretation and dispute resolution5. Some of these are set out in Annex A. Of course, these serve only as examples of current practice. The actual form of dispute resolution in a future relationship with the EU will be a matter for negotiations between the UK and the EU, and we should not be constrained by precedent. Different dispute resolution mechanisms could apply to different agreements, depending on how the new relationship with the EU is structured. Any arrangements must be ones that respect UK sovereignty, protect the role of our courts and maximise legal certainty, including for businesses, consumers, workers and other citizens. It is more important than ever that we face the future together, united by what makes us strong: the bonds that unite us, and our shared interest in the UK being an open, successful trading nation. 3.1 We have ensured since the referendum that the devolved administrations are fully engaged in our preparations to leave the EU and we are working with the administrations in Scotland, Wales and Northern Ireland to deliver an outcome that works for the whole of the UK. In seeking such a deal we will look to secure the specific interests of Scotland, Wales and Northern Ireland, as well as those of all parts of England. A good deal will be one that works for all parts of the UK. 3.2 The Prime Minister has already chaired two plenary meetings of the Joint Ministerial Committee, which brings together the leaders of the devolved administrations of Scotland, Wales and Northern Ireland. The first meeting agreed to set up a Joint Ministerial Committee on EU Negotiations (JMC(EN)), so ministers from each of the devolved administrations can contribute to the process of planning for our departure from the EU. At the January plenary session of the Joint Ministerial Committee, ministers agreed to intensify their work ahead of the triggering of Article 50 and to continue at the same pace thereafter. The JMC(EN) is chaired by the Secretary of State for Exiting the EU and its members include ministers from each of the UK devolved administrations. JMC(EN) has met on a monthly basis since its inception, and will continue to meet regularly to understand and consider each administration’s priorities; to seek to agree a UK approach to, and objectives for, negotiations, and to consider proposals put forward by the devolved administrations. At the first meeting, held in November, ministers set out their priorities for discussion at JMC(EN) and agreed to develop further the proposed work programme to ensure its connection to and involvement with the process of negotiations. Ministers agreed to meet monthly to share evidence and to take forward joint analysis, which would inform that work programme. At the second meeting, held in December, ministers discussed their priorities relating to law enforcement, security and criminal justice, civil judicial cooperation, immigration and trade. There was a follow up discussion from the last meeting of JMC(EN) on market access. Ministers agreed that officials should take forward joint analysis across the range of issues being considered by JMC(EN) and captured in the work programme. Ministers agreed to continue to engage bilaterally ahead of the next meeting in January. At the third meeting in January, the Scottish Government presented its paper on Scotland’s Place in Europe and the Committee agreed to undertake bilateral official-level discussions on the Scottish Government proposals. UK government departments also continue their significant bilateral engagement on the key issues relating to the UK’s withdrawal from the EU and on ongoing business. 3.3 The current devolution settlements were created in the context of the UK’s membership of the EU. All three settlements set out that devolved legislatures only have legislative competence – the ability to make law – in devolved policy areas as long as that law is compatible with EU law. 3.4 This has meant that, even in areas where the devolved legislatures and administrations currently have some competence, such as agriculture, environment and some transport issues, most rules are set through common EU legal and regulatory frameworks, devised and agreed in Brussels. When the UK leaves the EU, these rules will be set here in the UK by democratically elected representatives. 3.5 As the powers to make these rules are repatriated to the UK from the EU, we have an opportunity to determine the level best placed to make new laws and policies on these issues, ensuring power sits closer to the people of the UK than ever before. We have already committed that no decisions currently taken by the devolved administrations will be removed from them and we will use the opportunity of bringing decision making back to the UK to ensure that more decisions are devolved. The UK’s constitutional arrangements have evolved over time and been adapted to reflect the unique circumstances of the world’s most successful and enduring multi-nation state. These arrangements provide all of the UK with the space to pursue different domestic policies should they wish to, whilst protecting and preserving the benefits of being part of the wider UK. The current arrangements for governing the UK have been in place for almost 20 years. In September 1997, referendums were held in Scotland and Wales and a majority of voters chose to establish a Scottish Parliament and a National Assembly for Wales. In Northern Ireland, devolution was a key part of the Belfast Agreement, which was supported by voters in a referendum in May 1998. The UK Parliament passed legislation in 1998 to establish the three devolved legislatures and administrations and set out their powers. Throughout the last two decades, the settlements have continued to evolve; for example, new tax raising powers were devolved to the Scottish Parliament under the Scotland Act 2016 and the model of Welsh devolution was altered by the Wales Act 2017. The UK Government acts in the interests of the whole UK and is responsible for the UK’s international relations, including negotiations with the EU. It transacts those responsibilities in close consultation with the devolved administrations, underpinned by the principles set out in the Memorandum of Understanding agreed by all the administrations. 3.6 We must also recognise the importance of trade within the UK to all parts of the Union. For example, Scotland’s exports to the rest of the UK are estimated to be four times greater than those to the EU27 (in 2015, £49.8 billion compared with £12.3 billion).6 So our guiding principle will be to ensure that – as we leave the EU – no new barriers to living and doing business within our own Union are created. We will maintain the necessary common standards and frameworks for our own domestic market, empowering the UK as an open, trading nation to strike the best trade deals around the world and protecting our common resources. 3.7 On the basis of these principles, we will work with the devolved administrations on an approach to returning powers from the EU that works for the whole of the UK and reflects the interests of Scotland, Wales and Northern Ireland. 3.8 We will also continue to champion devolution to local government and are committed to devolving greater powers to local government where there is economic rationale to do so. In addition to the broad programme of engagement through JMC(EN), the UK Government has committed to examine any proposals brought forward by the devolved administrations. To date papers have been published by the Scottish and Welsh Governments. In December, the Scottish Government published Scotland’s Place in Europe7, which was presented to JMC(EN) in January. The UK and Scottish Governments are taking forward further discussions on the proposals detailed in the paper. The Northern Ireland Executive has not published a White Paper on EU exit. However, the former First and deputy First Ministers wrote to the Prime Minister setting out the key priorities for Northern Ireland last August. Ministers from the Northern Ireland Executive have participated in JMC(EN) discussions and presented evidence on the impact of EU exit in Northern Ireland and the priorities for Northern Ireland from the new relationship with the EU. Bilateral discussions will now be taken forward between each of the devolved administrations and the UK Government to fully understand their priorities, which will inform the continuing discussions. There are many areas where the devolved administrations and the UK Government agree, including on the importance of providing certainty for businesses across the UK, maintaining strong trading links with the EU, protecting the status of EU nationals in the UK and UK nationals in the EU and protecting workers’ rights. 3.10 We have ensured that their priorities are understood through a range of engagement including new fora dedicated to discussing the impact of EU exit: the Joint Ministerial Council on EU Negotiations, with representatives of the governments of the Overseas Territories, a new Joint Ministerial Council (Gibraltar EU Negotiations) with the Government of Gibraltar, and formal quarterly meetings with the Chief Ministers of the Crown Dependencies. We will continue to involve them fully in our work, respect their interests and engage with them as we enter negotiations, and strengthen the bonds between us as we forge a new relationship with the EU and look outward into the world. Maintaining our strong and historic ties with Ireland will be an important priority for the UK in the talks ahead. This includes protecting the Common Travel Area (CTA). 4.1 The UK and Ireland are inescapably intertwined through our shared history, culture and geography. It is a unique relationship: there are hundreds of thousands of Irish nationals residing in the UK and of UK nationals residing in Ireland. There are also close ties and family connections, particularly across the border between Northern Ireland and Ireland. Further information is provided in Annex B. 4.2 The relationship between the two countries has never been better or more settled than today, thanks to the strong political commitment from both Governments to deepen and broaden our modern partnership. Two recent State Visits, by Her Majesty The Queen in May 2011 and by President Higgins in April 2014, have helped cement this partnership; no one wants to see a return to the borders of the past. The Prime Minister is committed to maintaining the closest of ties and has already met the Taoiseach several times since taking office, most recently in Dublin in January 2017. 4.4 We recognise that for the people of Northern Ireland and Ireland, the ability to move freely across the border is an essential part of daily life. When the UK leaves the EU we aim to have as seamless and frictionless a border as possible between Northern Ireland and Ireland, so that we can continue to see the trade and everyday movements we have seen up to now. 4.5 We will work closely to ensure that, as the UK leaves the EU, we find shared solutions to the economic challenges and maximise the economic opportunities for both the UK and Ireland. 4.6 The close historic, social and cultural ties between the UK and Ireland predate both countries’ membership of the EU and have led to the enjoyment of additional rights beyond those associated with common membership of the EU. The special status afforded to Irish citizens within the UK is rooted in the Ireland Act 1949 and, for the people of Northern Ireland, in the 1998 Belfast Agreement. 4.7 Both the UK and Irish Governments have set out their desire to protect this reciprocal treatment of each other’s nationals once the UK has left the EU. In particular, in recognition of their importance in the Belfast Agreement, the people of Northern Ireland will continue to be able to identify themselves as British or Irish, or both, and to hold citizenship accordingly. The CTA is a special travel zone for the movement of people between the UK, Ireland, the Isle of Man and the Channel Islands. It was formed long before the UK and Ireland were members of the EU and reflects the deep-rooted, historical ties provided for by the free movement of respective members’ nationals within the CTA and the synergies between our countries. We are committed to protecting this arrangement. The adoption of the CTA was linked to the establishment of the Irish Free State in 1922, with separate legislative provision for the Crown Dependencies in 1919 and 1920. It originally arose as an administrative practice allowing free travel between CTA countries. It has since been reflected in each state’s application of national immigration policy, with all countries pursuing a common approach. With the exception of a short period during the Second World War there have not been immigration controls on journeys between CTA members. Protocol 22 of the EU Treaties provides that the UK and Ireland may continue to make arrangements between themselves relating to the movement of people within the CTA. Nationals of CTA members can travel freely within the CTA to the UK without being subject to routine passport controls. 4.8 We want to protect the ability to move freely between the UK and Ireland, north-south and east-west, recognising the special importance of this to people in their daily lives. We will work with the Northern Ireland Executive, the Irish Government and the Crown Dependencies to deliver a practical solution that allows for the maintenance of the CTA, while protecting the integrity of the UK’s immigration system. 4.9 We are determined that our record of collaboration, built on shared experience and values and supported by personal, political and economic ties, continues to develop and strengthen after we leave the EU. 4.10 We will work with the Irish Government and the Northern Ireland Executive to find a practical solution that recognises the unique economic, social and political context of the land border between Northern Ireland and Ireland. An explicit objective of the UK Government’s work on EU exit is to ensure that full account is taken for the particular circumstances of Northern Ireland. We will seek to safeguard business interests in the exit negotiations. We will maintain close operational collaboration between UK and Irish law enforcement and security agencies and their judicial counterparts. We will remain an open and tolerant country, and one that recognises the valuable contribution migrants make to our society and welcomes those with the skills and expertise to make our nation better still. 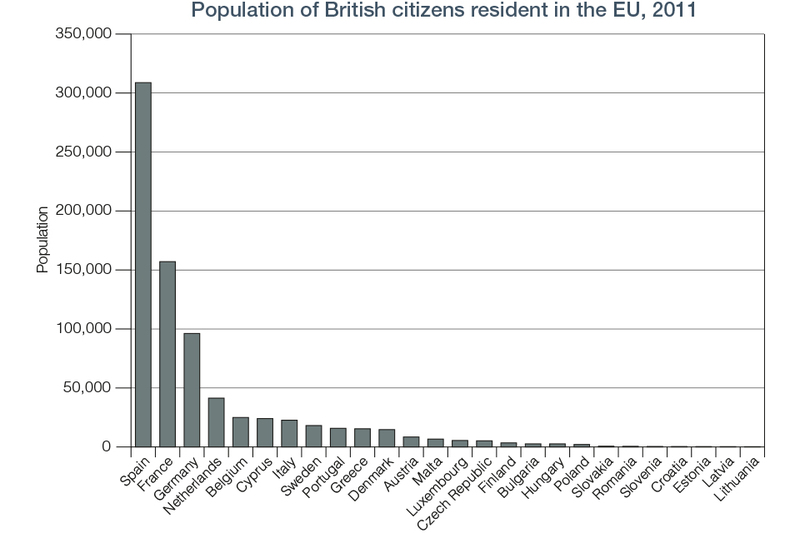 But in future we must ensure we can control the number of people coming to the UK from the EU. 5.1 As we leave the EU and embrace the world, openness to international talent will remain one of our most distinctive assets. 5.2 We welcome the contribution that migrants have brought and will continue to bring to our economy and society. That is why we will always want immigration, including from EU countries, and especially high-skilled immigration and why we will always welcome individual migrants arriving lawfully in the UK as friends. 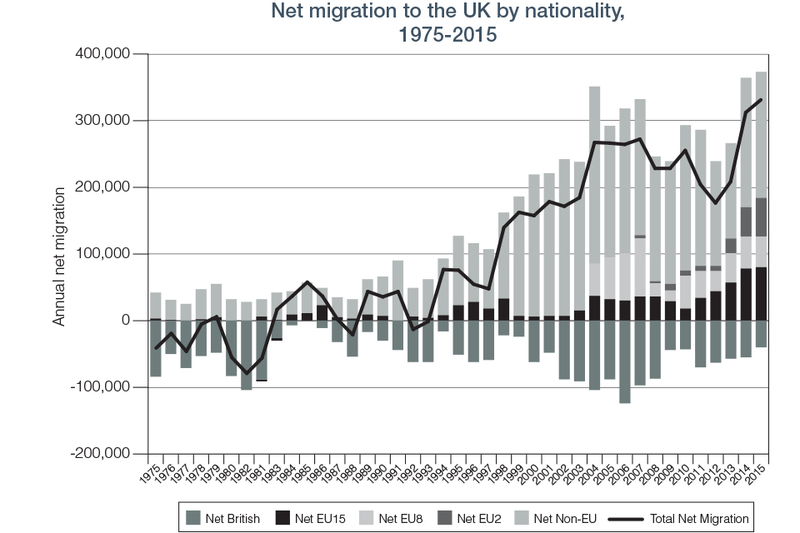 5.3 However, in the last decade or so, we have seen record levels of long term net migration in the UK,13 and that sheer volume has given rise to public concern about pressure on public services, like schools and our infrastructure, especially housing, as well as placing downward pressure on wages for people on the lowest incomes. The public must have confidence in our ability to control immigration. It is simply not possible to control immigration overall when there is unlimited free movement of people to the UK from the EU. 5.4 We will design our immigration system to ensure that we are able to control the numbers of people who come here from the EU. In future, therefore, the Free Movement Directive will no longer apply and the migration of EU nationals will be subject to UK law. 5.5 Immigration can bring great benefits – filling skills shortages, delivering public services and making the UK’s businesses the world-beaters they often are. But it must be controlled. 5.6 We will create an immigration system that allows us to control numbers and encourage the brightest and the best to come to this country, as part of a stable and prosperous future with the EU and our European partners. 5.7 The UK will always welcome genuine students and those with the skills and expertise to make our nation better still. We have already confirmed that existing EU students and those starting courses in 2016-17 and 2017-18 will continue to be eligible for student loans and home fee status for the duration of their course. We have also confirmed that research councils will continue to fund postgraduate students from the EU whose courses start in 2017-18. 5.8 The Government also recognises the important contribution made by students and academics from EU Member States to the UK’s world class universities. A global UK must also be a country that looks to the future. 5.9 We are considering very carefully the options that are open to us to gain control of the numbers of people coming to the UK from the EU. As part of that, it is important that we understand the impacts on the different sectors of the economy and the labour market. We will, therefore, ensure that businesses and communities have the opportunity to contribute their views. Equally, we will need to understand the potential impacts of any proposed changes in all the parts of the UK. So we will build a comprehensive picture of the needs and interests of all parts of the UK and look to develop a system that works for all. 5.10 Implementing any new immigration arrangements for EU nationals and the support they receive will be complex and Parliament will have an important role in considering these matters further. There may be a phased process of implementation to prepare for the new arrangements. This would give businesses and individuals enough time to plan and prepare for those new arrangements. Free movement rights can be exercised by EU citizens, their dependants and – in certain circumstances – other family members. These rights are largely set out in the EU Treaties and in secondary EU legislation. These rights have also been extended to nationals of the European Economic Area (EEA) states who are not members of the EU (Iceland, Norway and Liechtenstein) and to Switzerland by virtue of two separate agreements. EU citizens also have the right to exercise free movement rights in these states. EU secondary legislation provides further detail on the rights contained in the EU Treaties. There are key pieces of secondary EU legislation that are most relevant. The Free Movement Directive15 sets out the rights of EU citizens and their family members to move and reside freely within the territory of the EU. This Directive replaced most of the previous European legislation facilitating the migration of the economically active and it consolidated the rights of EU citizens and their family members to move and reside freely within the territory of the EU. The Directive is implemented in the UK via the Immigration (European Economic Area) Regulations 2016, which also apply to Swiss nationals and nationals of those EEA States which are not EU Member States. We want to secure the status of EU citizens who are already living in the UK, and that of UK nationals in other Member States, as early as we can. 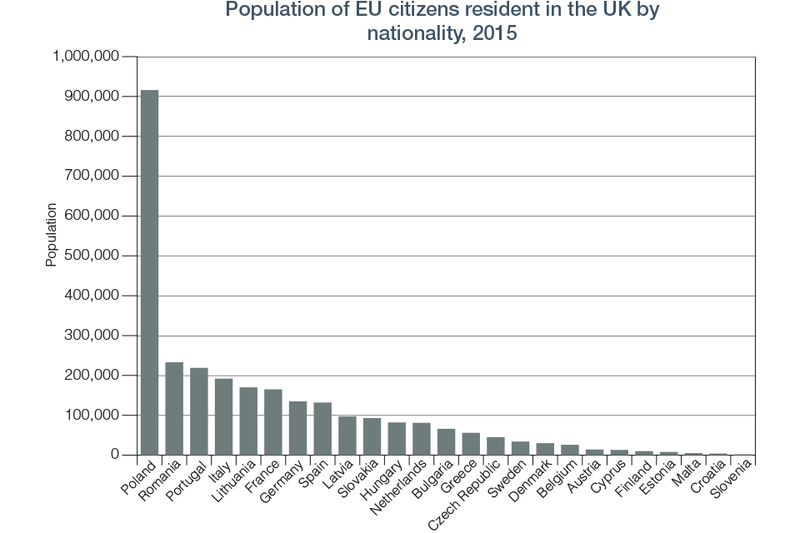 6.2 While we are a member of the EU, the rights of EU nationals living in the UK and UK nationals living in the EU remain unchanged. As provided for in both the EU Free Movement Directive (Article 16 of 2004/38/EC) and in UK law, those who have lived continuously and lawfully in a country for at least five years automatically have a permanent right to reside. We recognise the contribution EU nationals have made to our economy and communities. 6.3 Securing the status of, and providing certainty to, EU nationals already in the UK and to UK nationals in the EU is one of this Government’s early priorities for the forthcoming negotiations. To this end, we have engaged a range of stakeholders, including expatriate groups, to ensure we understand the priorities of UK nationals living in EU countries. This is part of our preparations for a smooth and orderly withdrawal and we will continue to work closely with a range of organisations and individuals to achieve this. For example, we recognise the priority placed on easy access to healthcare by UK nationals living in the EU. We are also engaging closely with EU Member States, businesses and other organisations to ensure that we have a thorough understanding of issues concerning the status of EU nationals in the UK. 6.4 The Government would have liked to resolve this issue ahead of the formal negotiations. And although many EU Member States favour such an agreement, this has not proven possible. The UK remains ready to give people the certainty they want and reach a reciprocal deal with our European partners at the earliest opportunity. It is the right and fair thing to do. 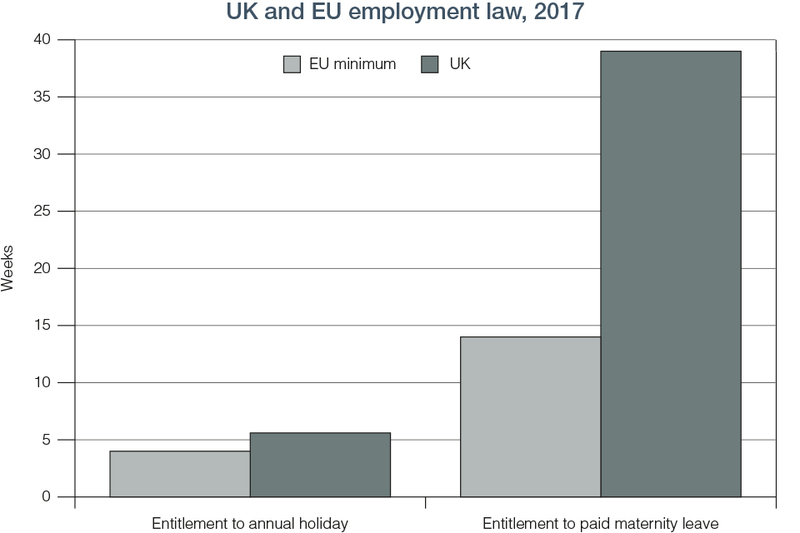 UK employment law already goes further than many of the standards set out in EU legislation and this Government will protect and enhance the rights people have at work. 7.1 As we convert the body of EU law into our domestic legislation, we will ensure the continued protection of workers’ rights. This will give certainty and continuity to employees and employers alike, creating stability in which the UK can grow and thrive. 7.3 These rights were the result of UK Government actions and do not depend on membership of the EU. The Government is committed to strengthening rights when it is the right choice for UK workers and will continue to seek out opportunities to enhance protections. 7.5 We have increased penalties for wilfully non-compliant employers and have set up a dedicated team to tackle the more serious cases. Furthermore, we are appointing a statutory Director of Labour Market Enforcement and Exploitation. These actions demonstrate our commitment to ensuring that hard working people are entitled to a fair wage and that they receive the pay to which they are entitled. 7.6 We are committed to maintaining our status as a global leader on workers’ rights and will make sure legal protection for workers keeps pace with the changing labour market. Specifically, an independent review of employment practices in the modern economy is now underway.33 The review will consider how employment rules need to change in order to keep pace with modern business models, such as: the rapid recent growth in self-employment; the shift in business practice from hiring to contracting; the rising use of non-standard contract forms and the emergence of new business models such as on-demand platforms. 7.7 Moreover, we will ensure that the voices of workers are heard by the boards of publicly-listed companies for the first time. We need business to be open, transparent and run for the benefit of all, not just a privileged few. It is for this reason that we launched a Green Paper on corporate governance in November 2016.34 This paper seeks a wide range of views on our current corporate governance regime, and particularly on executive pay, employee and customer voice and corporate governance in large private businesses. It represents a decisive step towards corporate governance reform and is yet another example of this Government’s commitment to building an economy that works for everyone, not just those at the top. The Government will prioritise securing the freest and most frictionless trade possible in goods and services between the UK and the EU. We will not be seeking membership of the Single Market, but will pursue instead a new strategic partnership with the EU, including an ambitious and comprehensive Free Trade Agreement and a new customs agreement. 8.1 It is in the interests of the EU and all parts of the UK for the deeply integrated trade and economic relationship between the UK and EU to be maintained after our exit from the EU. Our new relationship should aim for the freest possible trade in goods and services between the UK and the EU. It should give UK companies the maximum freedom to trade with and operate within European markets and let European businesses do the same in the UK. This should include a new customs agreement with the EU, which will help to support our aim of trade with the EU that is as frictionless as possible. 8.2 We do not seek to adopt a model already enjoyed by other countries. The UK already has zero tariffs on goods and a common regulatory framework with the EU Single Market. This position is unprecedented in previous trade negotiations. Unlike other trade negotiations, this is not about bringing two divergent systems together. It is about finding the best way for the benefit of the common systems and frameworks, that currently enable UK and EU businesses to trade with and operate in each others’ markets, to continue when we leave the EU through a new comprehensive, bold and ambitious free trade agreement. 8.3 That agreement may take in elements of current Single Market arrangements in certain areas as it makes no sense to start again from scratch when the UK and the remaining Member States have adhered to the same rules for so many years. Such an arrangement would be on a fully reciprocal basis and in our mutual interests. 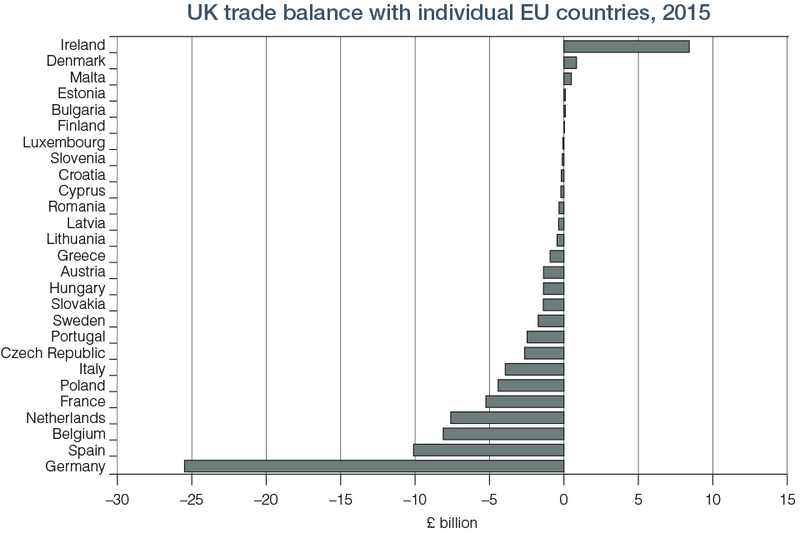 8.6 Close trading relationships with the EU exist across a range of sectors. The UK is a major export market for important sectors of the EU economy, including in manufactured and other goods, such as automotives, energy, food and drink, chemicals, pharmaceuticals and agriculture. These sectors employ millions of people around Europe. 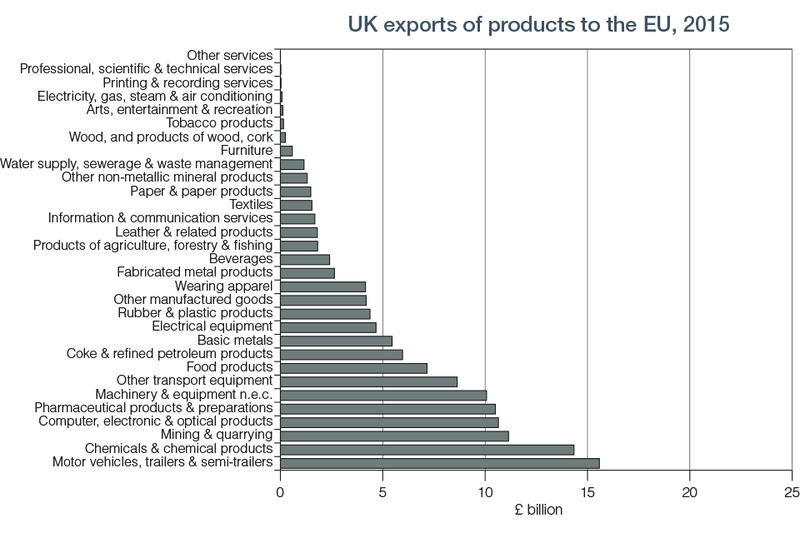 8.7 The UK exports a wide range of products and services to the EU. 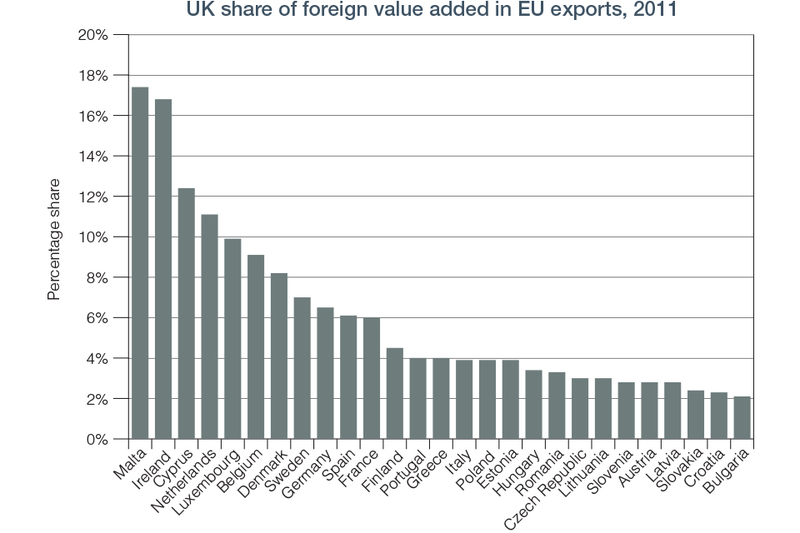 For example, exports of motor vehicles, chemicals and chemical products, financial services and other business services all account for significant shares of total UK exports to the EU. 8.10 We continue to supplement our analysis of trade data with a wide range of other analysis and engagement. We have structured our approach by five broad sectors covering the breadth of the UK economy: goods; agriculture, food and fisheries; services; financial services; and energy, transport and communications networks, as well as areas of crosscutting regulation. Within this, our stakeholder engagement and analysis covers over 50 specific sectors. 8.11 Free movement of goods within the EU is secured through a number of mechanisms, including through the principle of mutual recognition (which means that goods lawfully marketed in one Member State can be sold in all Member States), the harmonisation of product rules (where the same rules apply for a range of goods, such as for fertilisers, in all Member States) and agreement that manufacturers can use voluntary standards as a way of demonstrating compliance with certain essential characteristics set out in EU law (such as for toy safety). In a number of sectors covering typically higher risk goods (such as chemicals or medicines), the EU has also agreed more in-depth harmonised regulatory regimes, including for testing or licensing. Standards are voluntary technical agreements about the best way to do something, such as how to manufacture a certain product. They are developed by industry and other stakeholders through processes that seek consensus. The majority of standards have been developed for purely commercial reasons to support the interoperability of firms and international trade. Over time, standards have been increasingly developed at a global level, through the International Organization for Standardization (ISO) and International Electrotechnical Commission (IEC). These international standards are then adopted at regional, including European, and national levels. The British Standards Institution (BSI) will retain its membership of these organisations after exit and we expect the UK to continue to play a leading role in driving the development of global standards. The European Standards Organisations are not EU bodies, though they have a special status in the EU. Approximately 25 per cent of published European standards have, in part, and whilst still voluntary, been developed by the European Standards Organisations as a result of requests from the European Commission.48 This subset of standards provides businesses with a way of demonstrating compliance with EU product laws, such as with respect to gas appliance rules. We are working with BSI to ensure that our future relationship with the European Standards Organisations continues to support a productive, open and competitive business environment in the UK. 8.12 In many cases EU rules are based on global requirements. For example, the UN Economic Commission for Europe sets global vehicle safety standards. As part of our vision for an outward-facing global UK we will continue to play a leading role in such international fora. 8.13 Our new partnership should allow for tariff-free trade in goods that is as frictionless as possible between the UK and the EU Member States. 8.14 The UK’s agriculture, food and fisheries sectors are currently heavily influenced by EU laws, through frameworks such as the Common Agricultural Policy (CAP) and the Common Fisheries Policy, and through other rules meeting multiple objectives, such as high levels of environmental protection or animal welfare. 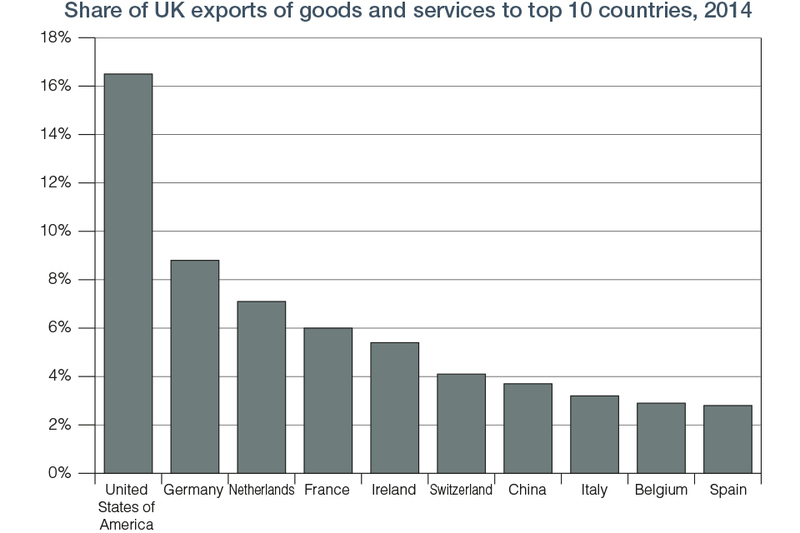 8.15 With respect to agriculture and food, the UK is a net importer of agri-food goods. Whilst UK exports of agriculture, fisheries and food products to the EU were £11 billion in 2015, imports were £28 billion and over 70 per cent of our annual agri-food imports come from the EU.49 This underlines the UK and EU’s mutual interest in ensuring continued high levels of market access in future. In addition, and with EU spend on CAP at around €58 billion in 2014 (nearly 40 per cent of the EU’s budget),50 leaving the EU offers the UK a significant opportunity to design new, better and more efficient policies for delivering sustainable and productive farming, land management and rural communities. This will enable us to deliver our vision for a world-leading food and farming industry and a cleaner, healthier environment, benefiting people and the economy. 8.16 In 2015, EU vessels caught 683,000 tonnes (£484 million revenue) in UK waters and UK vessels caught 111,000 tonnes (£114 million revenue) in Member States’ waters.51 Given the heavy reliance on UK waters of the EU fishing industry and the importance of EU waters to the UK, it is in both our interests to reach a mutually beneficial deal that works for the UK and the EU’s fishing communities. Following EU exit, we will want to ensure a sustainable and profitable seafood sector and deliver a cleaner, healthier and more productive marine environment. 8.17 The services sector is large and diverse, including areas such as retail, accountancy, consulting, legal services, business services, creative industries – like film, TV, design, music and fashion – medical services, tourism and catering. Firms increasingly use logistics, communications services and business services to facilitate the effective functioning of their supply chains. In particular, the professional and business services sector provides valuable consultancy and administrative services to a range of sectors including financial services. 8.19 We recognise that an effective system of civil judicial cooperation will provide certainty and protection for citizens and businesses of a stronger global UK. 8.20 The EU is a party to negotiations on the Trade in Services Agreement (TiSA) with more than twenty other countries. The UK continues to be committed to an ambitious TiSA and will play a positive role throughout the negotiations. 8.21 In our new strategic partnership we will be aiming for the freest possible trade in services between the UK and EU Member States. 8.22 The financial services sector is an important part of our economy. It is not just a London-based sector; for example, two thirds of financial and related professional services53 jobs are based outside the capital, including 156,700 in Scotland, 54,300 in Wales and 32,000 in Northern Ireland.54 The UK is a global leader in a range of activities, including complex insurance, wholesale markets and investment banking, the provision of market infrastructure, asset management and FinTech. 8.24 Additionally, there are provisions that allow firms from ‘third countries’ to provide services across the EU, provided that their relevant domestic regulations have been deemed equivalent to those of the EU. 8.25 In our new strategic partnership agreement we will be aiming for the freest possible trade in financial services between the UK and EU Member States. 8.26 In highly integrated sectors such as financial services there will be a legitimate interest in mutual cooperation arrangements that recognise the interconnectedness of markets, as so clearly demonstrated by the financial crisis. Since that time, the EU has taken a number of steps to strengthen collective oversight of the sector. As the UK leaves the EU, we will seek to establish strong cooperative oversight arrangements with the EU and will continue to support and implement international standards to continue to safely serve the UK, European and global economy. The financial services sector is an important part of the European economy, contributing significantly to the funding and growth of European business. It is in the interests of the UK and the EU that this should continue in order to avoid market fragmentation and the possible disruption or withdrawal of services. EU27 firms also have an interest in continuing to serve UK customers. The fundamental strengths that underpin the UK financial services sector, such as our legal system, language and our world-class infrastructure will help to ensure that the UK remains a pre-eminent global financial centre. 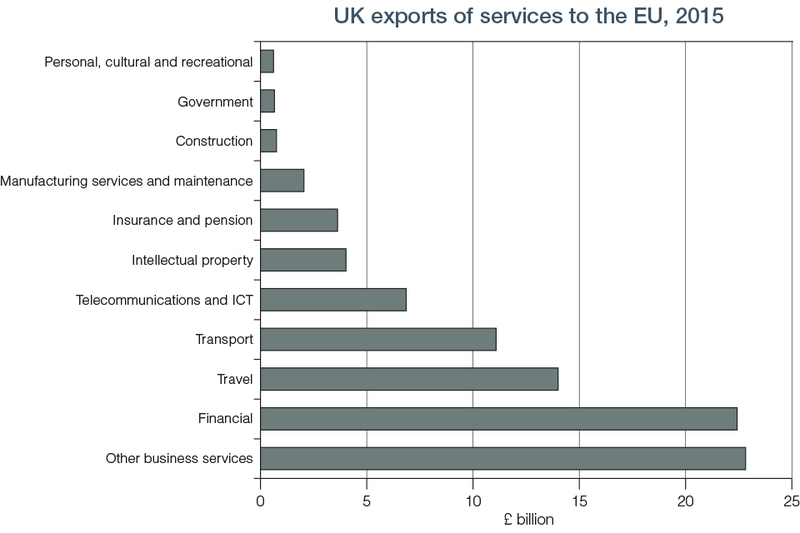 8.27 There are three UK-wide network industries and associated services which interact extensively with the EU: transport, energy and communications. All three are important in their own right and are key ‘enablers’ to the functioning and success of the economy as a whole. 8.28 With respect to energy, EU legislation underpins the coordinated trading of gas and electricity through existing interconnectors with Member States, including Ireland, France, Belgium and the Netherlands. There are also plans for further electricity interconnections between the UK and EU Member States and EEA Members. These coordinated energy trading arrangements help to ensure lower prices and improved security of supply for both the UK and EU Member States by improving the efficiency and reliability of interconnector flows, reducing the need for domestic back-up power and helping balance power flows as we increase the level of intermittent renewable electricity generation. We are considering all options for the UK’s future relationship with the EU on energy, in particular, to avoid disruption to the all-Ireland single electricity market operating across the island of Ireland, on which both Northern Ireland and Ireland rely for affordable, sustainable and secure electricity supplies. 8.29 The Euratom Treaty provides the legal framework for civil nuclear power generation and radioactive waste management for members of the Euratom Community, all of whom are EU Member States. This includes arrangements for nuclear safeguards, safety and the movement and trade of nuclear materials both between Euratom Members such as France and the UK, as well as between Euratom Members and third countries such as the US. 8.30 When we invoke Article 50, we will be leaving Euratom as well as the EU. Although Euratom was established in a treaty separate to EU agreements and treaties, it uses the same institutions as the EU including the Commission, Council of Ministers and the Court of Justice.60 The European Union (Amendment) Act 2008 makes clear that, in UK law, references to the EU include Euratom. The Euratom Treaty imports Article 50 into its provisions. 8.31 As the Prime Minister has said, we want to collaborate with our EU partners on matters relating to science and research, and nuclear energy is a key part of this. So our precise relationship with Euratom, and the means by which we cooperate on nuclear matters, will be a matter for the negotiations – but it is an important priority for us – the nuclear industry remains of key strategic importance to the UK and leaving Euratom does not affect our clear aim of seeking to maintain close and effective arrangements for civil nuclear cooperation, safeguards, safety and trade with Europe and our international partners. Furthermore, the UK is a world leader in nuclear research and development and there is no intention to reduce our ambition in this important area. The UK fully recognises the importance of international collaboration in nuclear research and development and we will ensure this continues by seeking alternative arrangements. 8.32 In the transport sector, there is a substantial body of EU law covering four transport modes (aviation, roads, rail and maritime), which governs our current relationship with the EU, and which will need to be taken into consideration as we negotiate our future relationship. For example, in aviation, the standard international arrangement is that air services operate under rights granted through bilateral air services agreements between nation states. In the late 1980s and early 1990s the EU created an internal aviation market whereby any carrier licensed in the EU is entitled to operate any service in the EU, superseding the old bilateral arrangements. As we exit the EU, there will be a clear interest for all sides to seek arrangements that continue to support affordable and accessible air transport for all European citizens, as well as maintaining and developing connectivity. We will also seek to agree bilateral air services agreements with countries like the US, where our air services arrangements are currently covered by an agreement between the EU and the US. 8.34 With respect to communications networks, telecoms operators are regulated in the UK by the EU’s ‘Electronic Communications Framework’, which promotes competition and choice. As we exit the EU, we will want to ensure that UK telecoms companies can continue to trade as freely and competitively as possible with the EU and let European companies do the same in the UK. 8.35 Content that is carried over electronic communication networks is regulated in the EU by the Audiovisual Media Services Directive. This underpins the operation of the internal market for broadcasting by ensuring the freedom to provide broadcasting services throughout the EU. The UK is currently the EU’s biggest broadcasting hub, hosting a large number of international broadcasting companies. In the course of the negotiations, we will focus on ensuring the ability to trade as freely as possible with the EU and supporting the continued growth of the UK’s broadcasting sector. 8.36 A range of cross-cutting regulations underpin the provision and high standards of goods and services, maintaining a positive environment for businesses, investors and consumers. For example, a common competition and consumer protection framework deals with mergers, monopolies and anti-competitive activity and unfair trading within the EU on a consistent basis, and EU-wide systems facilitate the protection of intellectual property. 8.37 As we leave the EU, the Government is committed to making the UK the best place in the world to do business. This will mean fostering a high quality, stable and predictable regulatory environment, whilst also actively taking opportunities to reduce the cost of unnecessary regulation and to support innovative business models. 8.41 The Government is committed to ensuring we become the first generation to leave the environment in a better state than we found it. We will use the Great Repeal Bill to bring the current framework of environmental regulation into UK and devolved law. The UK’s climate action will continue to be underpinned by our climate targets as set out in the Climate Change Act 2008 and through our system of five-yearly carbon budgets, which in turn support our international work to drive climate ambition. We want to take this opportunity to develop over time a comprehensive approach to improving our environment in a way that is fit for our specific needs. 8.42 There are a number of EU agencies, such as the European Medicines Agency (EMA), the European Chemicals Agency (ECHA), the European Aviation Safety Agency (EASA), the European Food Safety Authority (EFSA) and the European (Financial Services) Supervisory Authorities (ESAs), which have been established to support EU Member States and their citizens. These can be responsible for enforcing particular regulatory regimes, or for pooling knowledge and information sharing. As part of exit negotiations the Government will discuss with the EU and Member States our future status and arrangements with regard to these agencies. 8.43 After we have left the EU, we want to ensure that we can take advantage of the opportunity to negotiate our own preferential trade agreements around the world. We will not be bound by the EU’s Common External Tariff or participate in the Common Commercial Policy. But we do want to ensure that cross-border trade with the EU is as frictionless and seamless as possible. These are our guiding objectives for the future customs arrangements with the EU. A customs union is an arrangement between two or more countries designed to allow goods to circulate freely within the area of the customs union, by the introduction of a common external tariff for its members and the removal of tariffs between them. It does not cover trade in services or free movement of capital or people. A customs union facilitates the movement of goods between its members. However the requirement to have a common external tariff, applied equally by all members, by its nature restricts members’ ability to enter into separate free trade agreements (FTAs) with third countries, by preventing members from applying a different tariff to the common external tariff. Goods in the EU Customs Union move freely without tariffs, quotas or routine customs controls. Tariffs, quotas and customs controls for goods moving between the EU and non-EU countries are determined at EU, rather than national, level. Under the EU Customs Union, customs policy is the exclusive competence of the EU. All EU Member States are required to operate customs procedures in accordance with EU legislation (the ‘Union Customs Code’). The UK decides which government department or agency is responsible for implementing and enforcing customs law in the UK. Within the last decade, the UK has seen various customs functions performed by HM Revenue and Customs, the UK Border Agency and Border Force. Currently customs functions are performed by HM Revenue and Customs and Border Force. Services are not directly included in a customs union (they are subject to neither tariffs nor customs controls) but have become increasingly embedded in goods production. So a customs union could indirectly affect trade in services industries, for example, in parallel to exporting cars, an automotive firm might also provide financial services. 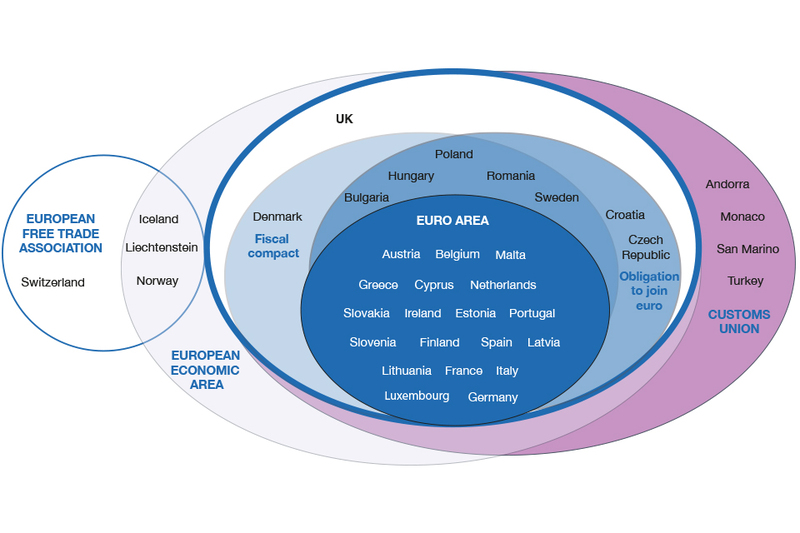 The diagram below shows which countries are members of the various groupings associated with the EU. As set out above, all EU Member States are in the EU Customs Union. A number of additional countries also have a customs union arrangement with the EU, such as Turkey. 8.45 In leaving the EU, the UK will seek a new customs arrangement with the EU, which enables us to make the most of the opportunities from trade with others and for trade between the UK and the EU to continue to be as frictionless as possible. There are a number of options for any new customs arrangement, including a completely new agreement, or for the UK to remain a signatory to some of the elements of the existing arrangements. The precise form of this new agreement will be the subject of negotiation. 8.46 It is in the interests of both the UK and the EU to have a mutually beneficial customs arrangement to ensure goods trade between the UK and EU can continue as much as possible as it does now. This will form a key part of our ambition for a new strategic partnership with the EU. 8.47 Whatever form that customs arrangement takes, and whatever the mechanism to deliver it, we will seek to maintain many of the facilitations that businesses currently enjoy, whilst aiming that, if there are requirements for customs procedures, these are as frictionless as possible. Whilst we will look at precedents set by customs agreements between other countries, we will not seek to replicate another country’s model and will pursue the best possible deal for the UK. 8.48 Alongside a new arrangement with the EU, we will also look to ensure that the UK’s own customs systems and processes continue to be as effective as possible. We have an open mind on how we implement new customs arrangements with the EU and we will work with businesses and infrastructure providers to ensure those processes are as frictionless as possible, including through the use of digital technologies. 8.49 We are also aware of the specific circumstances faced by businesses in Northern Ireland. We are committed to negotiating a deal that works for the whole of the UK. As with the Common Travel Area, we are committed to working with the Irish Government and the Northern Ireland Executive to minimise administrative burdens, and to find a practical solution that keeps the border as seamless and frictionless as possible, recognising the unique economic, social and political context of the land border between Northern Ireland and Ireland. 8.50 We will want to work closely together with the Irish Government to ensure that, as the UK leaves the EU, we find shared solutions to the challenges and maximise the opportunities for both the UK and Ireland. 8.51 Once we have left the EU, decisions on how taxpayers’ money will be spent will be made in the UK. As we will no longer be members of the Single Market, we will not be required to make vast contributions to the EU budget. There may be European programmes in which we might want to participate. If so, it is reasonable that we should make an appropriate contribution. But this will be a decision for the UK as we negotiate the new arrangements. By leaving the EU we will have the opportunity to strike free trade agreements with countries around the world. We will be champions of free trade driving forward liberalisation bilaterally, as well as in wider groupings, and we will continue to support the international rules based system. 9.1 The UK is proud of its long and successful history as a trading nation. 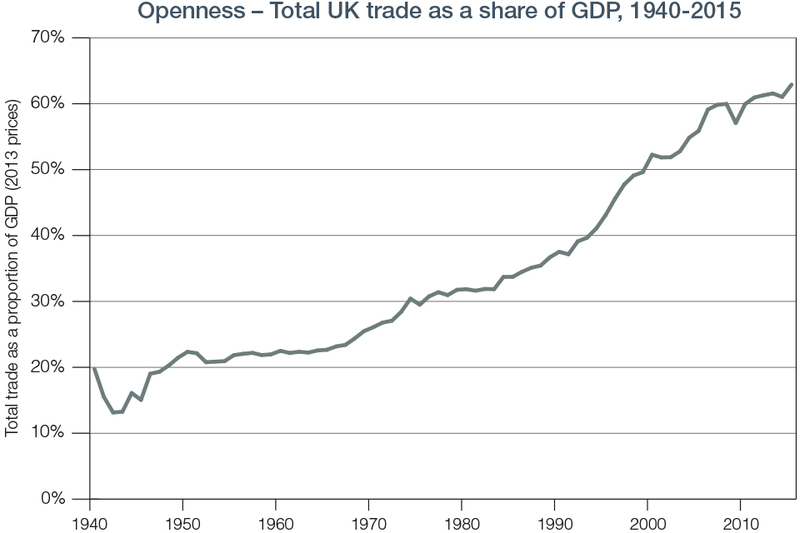 As Chart 9.1 shows, the UK has seen steady growth in overall trade as a percentage of GDP in the entire post-war period.69 We have long been a strong supporter of global trade liberalisation and of the rules based system for trade. An international rules based system is crucial for underpinning free trade and to ward off protectionism. 9.2 The UK has always been a powerful advocate for the EU’s liberalising agenda, whether in terms of creating and deepening the Single Market or securing free trade agreements with other nations. We will continue to support the EU’s trade agenda while we remain a member. After we leave we will look to increase significantly UK trade with the fastest growing and most dynamic export markets in the world. 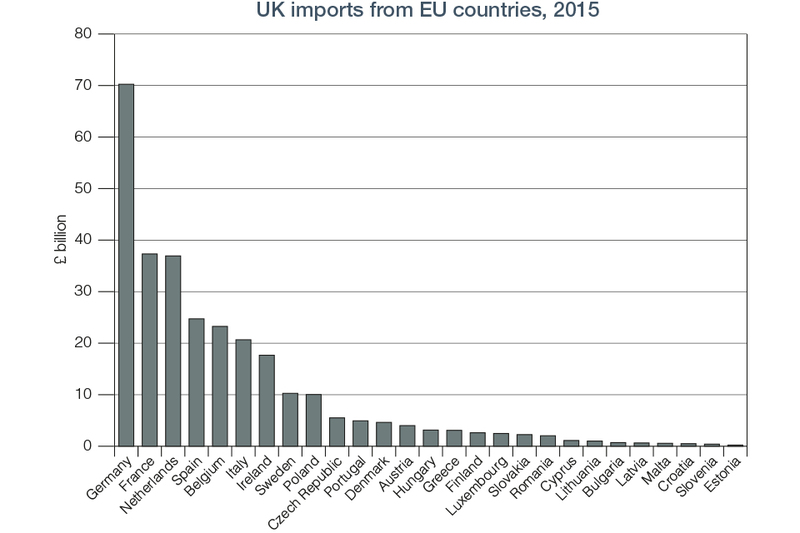 The EU remains an important trading partner for the UK, but the importance of other markets outside the EU has been increasing in relative terms. 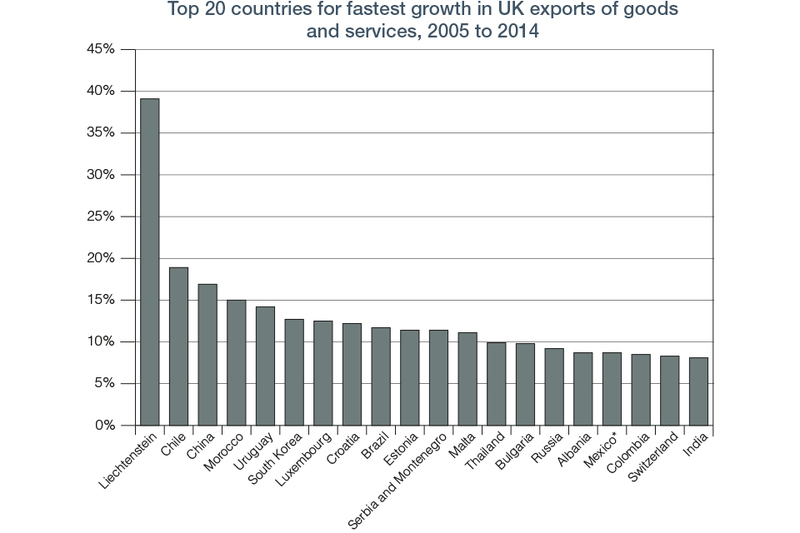 The share of UK exports to the EU has declined from 54 per cent in 2000 down to 44 per cent in 2015.71 Furthermore, annual growth in UK exports to the EU (around 2.5 per cent between 2005/2015) has lagged behind annual growth in global exports (over 4 per cent between 2005/2015).72 As can be seen in Chart 9.2 below, the United States is our single biggest export market on a country-by-country basis. 9.5 After leaving the EU, the UK will build on these strengths and our historic role as a global trading nation to realise the opportunities available to us. By boosting trade and opening markets and attracting the world’s most successful companies to invest in the UK, we will create jobs and enhance productivity and GDP. Increasing competition and encouraging businesses to innovate enables suppliers to access higher quality and cheaper products in their supply chain and gives consumers more choice and lower prices. 9.6 Our approach to trade policy will include a variety of levers including: bilateral FTAs and dialogues with third countries, participation in multilateral and plurilateral negotiations, market access and dispute resolution through the WTO, trade remedies, import and export controls, unilateral liberalisation, trade preferences and trade for development. 9.7 Without the need to reflect the positions of the EU27, an independent trade policy gives us the opportunity to strike deals better suited to the UK and to make quicker progress with new partners, as well as those where EU negotiations have stalled. 9.8 Work is underway to define the Government’s approach to trade policy. In due course the Government will want to consult business and other interested parties on the detailed positions it should adopt. 9.10 This department will lead the UK’s ambitions for deepening trade and investment relations with the wider world. Many countries including China, Brazil, and the Gulf States have already expressed their interest in enhancing their trading relationships with us. We have started discussions on future trade ties with countries like Australia, New Zealand and India. The new United States Administration, the world’s biggest economy,80 has said that they are interested in an early trade agreement with the UK. 9.11 We are also seeking to achieve continuity in our trade and investment relationships with third countries, including those covered by existing EU free trade agreements or EU preferential arrangements. We are exploring with our trading partners ways to achieve this. 9.12 While we cannot agree new trade deals until after we have left the EU, there is much that we can do to prepare and to achieve now, while respecting our obligations as members of the EU. The Department for International Trade’s International Trade and Investment division (ITI – formerly UK Trade and Investment) provides access, support and advice to UK business, both in the UK and abroad, with over 2,700 staff working across the UK and 108 markets overseas. Our global network is located in UK embassies and consulates, allowing DIT staff and UK diplomats to share networks, influence and resources. It also works in collaboration with the devolved administrations to help promote the UK’s exporting capability as a whole. 9.13 In addition the UK can prepare the ground for our exit from the EU through discussions with current EU trade partners so as to deliver maximum continuity and certainty for businesses once we leave, as well as to ensure continued preferential arrangements for developing countries. 9.16 The UK is a founding member of the WTO and has been a member of the General Agreement on Tariffs and Trade since 1948. Our WTO membership will form the bedrock on which we build our future trade relationships. It secures access rights to other members’ markets, provides a framework through which those rights can be enforced and provides a common rules-based approach to commerce across all WTO members that businesses can understand and rely on. 9.17 As part of leaving the EU the UK will need to establish our own schedules covering trade in goods and services at the WTO, providing clarity for UK business about their access to overseas markets around the world and also providing a clear basis for negotiating new trade agreements, not just with the EU, but with old friends and new allies from outside Europe too. 9.18 As the Secretary of State for International Trade informed Parliament on 5 December 2016, work is already underway on this. Our aim is to establish our schedules in a way that replicates as far as possible our current position as an EU Member State, thus creating a mutually beneficial, simple and inclusive outcome, so that the interests of the UK and other WTO members are protected. 9.19 The UK will also pursue our long-held pro-trade and pro-development stance in the relevant international institutions and organisations, such as the G7 and G20, the UN and the OECD, with enhanced vigour. From space exploration to clean energy, from medical technologies to agri-tech, the UK will remain at the forefront of collective endeavours to better understand, and make better, the world in which we live. We will seek agreement to continue to collaborate with our European partners on major science, research, and technology initiatives. 10.1 A global UK must be a country that looks to the future. That means being one of the best places in the world for science and innovation, leading to new products, services and better ways of doing business that are a fundamental driver of economic growth and long-term UK competitiveness. 10.3 The Government is committed to building on the UK’s world-leading science base – including more Nobel Laureates than any country outside the United States87 – and making the UK the go-to nation for scientists, innovators and investors in technology. 10.4 This Government’s pledge to invest in research and innovation is sending a clear message that the UK is committed to protecting the UK’s strength in science. 10.5 The Autumn Statement confirmed the Government’s long term commitment to research and innovation, including through a substantial increase in government investment, worth an extra £2 billion a year by 2020/21.88 The new Industrial Strategy Challenge Fund that this money will support will back priority technologies, such as robotics and biotechnology, where the UK has the potential to turn strengths in research into a global industrial and commercial lead. 10.6 Building Our Industrial Strategy, published on 23 January,89 built on these announcements. It set out proposals to capitalise on the UK’s strategic strengths, and to make sure that we do more to commercialise the world-leading ideas and discoveries made in Britain. It will put the UK and our companies at the forefront of innovation, developing new products and services that address the challenges of the future. 10.7 We are engaging widely with sector representatives to ensure a smooth transition to future arrangements. For example, the Government has established a High Level Stakeholder Working Group on EU Exit, Universities, Research and Innovation, which includes a number of senior representatives of UK research and innovation funders, Higher Education Institutions, national academies and learned societies and business. This group will work with the Government to ensure that the UK builds on its strong global position in research and innovation excellence. 10.8 The Government has also taken quick and decisive action to respond to concerns of the science and research sectors, providing reassurance and certainty. 10.9 For example HM Treasury has announced that researchers should continue to bid for competitive EU research funding, such as Horizon 2020, while the UK remains a member of the EU. The Government will work with the European Commission to ensure payment when funds are awarded and HM Treasury will underwrite the payment of such awards, even when specific projects continue beyond the UK’s departure from the EU. This has given UK participants and their EU partners the certainty needed to plan ahead for projects that can run over many years. 10.10 The guarantees that HM Treasury has provided sent a clear message to UK businesses and universities that, while we remain a member of the EU, they should continue to bid for competitive EU funding. 10.11 The Government has provided further assurances by confirming that existing EU students and those starting courses in 2016-17 and 2017-18 will continue to be eligible for student loans and home fee status for the duration of their courses. We recently extended that assurance to postgraduate support through Research Council studentships, which will remain open on the current basis to EU students starting courses in the 2017-18 academic year. The funding support will cover the duration of their course, even if the course concludes after the UK has left the EU. 10.13 The UK has a proud history of leading and supporting cutting-edge research and innovation within the EU. We are an active participant in Horizon 2020, the EU’s main funding instrument for collaboration on research and innovation. In addition, the UK has played a major part in developing the main EU space programmes, Galileo and Copernicus, which have supported the rapid growth of the UK space sector and contributed directly to our prosperity and security. The UK was a founding member of the European Space Agency, to which we recently committed €1.4 billion in cutting edge research and development over the next four years. The UK has also been a driving force behind European and international research on nuclear fusion. 10.14 As we exit the EU, we would welcome agreement to continue to collaborate with our European partners on major science, research and technology initiatives. We will continue to work with the EU to preserve UK and European security, and to fight terrorism and uphold justice across Europe. 11.1 The safety of the UK public is the top priority for the Government. The UK has always been, and will continue to be, a major global player in the fight against threats to security. With the threat constantly evolving, our response must be to work more closely with our partners, including the EU and its Member States, sharing information and supporting each other in combating the threats posed by those who wish us harm. We continue to cooperate closely with our European partners on foreign affairs and provide strong support in tackling the threat of terrorism. This cooperation has already intensified in the wake of the recent attacks in Paris, Brussels and Berlin. It is in all our interests that we continue our deep cooperation with the EU and its Member States to tackle these threats together. 11.3 Operational cooperation with our European partners has continued since the referendum and the UK will continue to participate fully in EU security and criminal justice measures while we remain a member of the EU. 11.4 Key European partners have made clear that they intend to continue, and indeed deepen, security cooperation, recognising UK expertise in the fight against terrorism, particularly in light of recent attacks and the threat posed by foreign terrorist fighters. 11.5 Our commitment to cooperation on cyber security with our European and global allies will be undiminished and we will continue to work closely with international partners to build capability in countering cyber threats and to ensure the continuation of a free, open, peaceful and secure cyberspace. 11.6 Similarly, serious and organised crime is a transnational threat, requiring a cross-border response. The UK has an excellent record on tackling serious and organised crime, but this alone is not enough; if we are to reduce the threat of serious and organised crime we must continue to work together with our European partners. 11.7 As we exit, we will therefore look to negotiate the best deal we can with the EU to cooperate in the fight against crime and terrorism. We will seek a strong and close future relationship with the EU, with a focus on operational and practical cross-border cooperation. We will seek a relationship that is capable of responding to the changing threats we face together. Public safety in the UK and the rest of Europe will be at the heart of this aspect of our negotiation. 11.8 More broadly, the UK will continue to be one of the most important global actors in international affairs. Along with France, we are the only EU Member State with an independent nuclear deterrent and a permanent seat on the UN Security Council. We are one of only four European countries who spend the NATO recommended two per cent of GDP on defence.97 We are one of only a handful of countries in the G20 that has pledged to and delivered on spending 0.7 per cent of GNI on overseas aid.98 We will continue to be a leading actor, working with European and other international partners, in global efforts to tackle major challenges, including climate change. 11.9 We want to use our tools and privileged position in international affairs to continue to work with the EU on foreign policy security and defence. Whether it is implementing sanctions against Russia following its actions in Ukraine, working for peace and stability in the Balkans, or securing Europe’s external border, we will continue to play a leading role alongside EU partners in buttressing and promoting European security and influence around the world. We aim to enhance our strong bilateral relationships with our European partners and beyond, projecting a truly global UK across the world. 11.10 The Government’s national security strategy established clear national security objectives. The 2015 Strategic Defence and Security Review (SDSR) set out a funded plan to achieve them and we are now focused on delivering that plan. 11.11 We participate in Common Security and Defence Policy (CSDP) missions and operations across the globe. Our objective is to ensure that the EU’s role on defence and security is complementary to, and respects the central role of, NATO. After we leave the EU, we will remain committed to European security and add value to EU foreign and security policy. 11.12 We participate in Common Security and Defence Policy CSDP missions and operations across the globe. Our priority missions have had some notable successes. Operation ATALANTA has successfully tackled piracy off the Horn of Africa – this operation is commanded from the UK and we have supported it since it began in 2008. Since 2004 Operation ALTHEA has made a valuable contribution to stability in Bosnia. In the Mediterranean, working with the EU as part of Operation SOPHIA, the UK has helped to save 10,200 lives, destroyed 124 smuggling boats and apprehended 20 suspected smugglers. This operation is an important part of the EU’s and UK’s wider migration strategy. 11.13 Our contribution to civilian missions has helped increase stability in Europe, notably in Kosovo, Georgia, and Ukraine. Further afield, we contribute to efforts to increase stability in Libya, the Occupied Palestinian Territories and Somalia. 11.15 Although we are leaving the EU, the UK will continue to play a leading role as a global foreign and security policy actor. 11.16 The UK has a leading role in NATO’s enhanced Forward Presence. We are providing the Framework Battalion of around 800 military personnel in Estonia, based around armoured infantry equipped with Warrior armoured fighting vehicles, and a troop of our Challenger 2 Main Battle Tanks. We are also sending a reconnaissance squadron of around 150 military personnel to Poland. 11.17 The UK is also playing a leading role in NATO’s Response Force (NRF) – a highly ready and technologically advanced, multinational force made up of land, air, maritime and Special Operations Forces (SOF) components that the Alliance can deploy quickly, wherever needed. In addition to its operational role, the NRF can be used for greater cooperation in education and training, increased exercises and better use of technology. 11.18 We will also contribute to NATO’s Southern Air Policing mission this summer, based in Romania, through the provision of Typhoon aircraft. Typhoon offers a proven and credible air defence capability alongside Romanian air defence aircraft. 11.19 We will remain a global power, and will continue to work with European partners to tackle shared challenges. Delivering a smooth, mutually beneficial exit will require a coherent and coordinated approach on both sides. We want to avoid a disruptive cliff-edge, and we should consider the need for phasing in any new arrangements we require as the UK and the EU move towards a new partnership. 12.1 We will formally trigger the process of leaving the EU by invoking Article 50 of the Treaty on European Union no later than the end of March this year. As set out in Article 50, the Treaties of the EU will cease to apply to the UK when the withdrawal agreement enters into force, or failing that, two years from the day we submit our notification, unless there is a unanimous agreement with the other 27 Member States to extend the process. 12.2 It is, however, in no one’s interests for there to be a cliff-edge for business or a threat to stability, as we change from our existing relationship to a new partnership with the EU. Instead, we want to have reached an agreement about our future partnership by the time the two year Article 50 process has concluded. From that point onwards, we believe a phased process of implementation, in which the UK, the EU institutions and Member States prepare for the new arrangements that will exist between us, will be in our mutual interest. This will give businesses enough time to plan and prepare for those new arrangements. This might be about our immigration controls, customs systems or the way in which we cooperate on criminal and civil justice matters. Or it might be about the future legal and regulatory framework for business. For each issue, the time we need to phase in the new arrangements may differ; some might be introduced very quickly, some might take longer. And the interim arrangements we rely upon are likely to be a matter of negotiation. The UK will not, however, seek some form of unlimited transitional status. That would not be good for the UK and nor would it be good for the EU. 12.3 We are confident that the UK and the EU can reach a positive deal on our future partnership, as this would be to the mutual benefit of both the UK and the EU, and we will approach the negotiations in this spirit. However, the Government is clear that no deal for the UK is better than a bad deal for the UK. In any eventuality we will ensure that our economic and other functions can continue, including by passing legislation as necessary to mitigate the effects of failing to reach a deal. The Government has made clear that we will honour the choice that the people of the UK made on 23 June 2016; the UK will leave the EU. We will seek an ambitious future relationship with the EU which works for all the people of the UK and which allows the UK to fulfill its aspirations for a truly global UK. On 23 June 2016, the people of the UK voted to leave the EU. This Government will carry out their will. We are confident that the UK can have a successful and independent future outside the EU, which works for all the people of the UK, regardless of how they voted in the referendum. In seeking such a future, we will look to secure the specific interests of Scotland, Wales and Northern Ireland as well as those of all parts of England. This Government will make no attempt to remain in the EU by the backdoor, nor will we hold a second referendum on membership. Instead, the strategic partnership which we seek will underpin free trade between the UK and EU, recognising the deep integration and harmonisation that we have achieved as members of the EU, as well as the closest possible cooperation on key issues like security, foreign policy and science and technology – as we have set out in this White Paper. We will honour the UK’s profoundly internationalist history and culture by building a truly global UK. And we will use this historic moment of change to build a stronger economy and a fairer society by embracing genuine economic and social reform. It remains overwhelmingly and compellingly in the UK’s national interest that the EU should succeed. Our vote to leave the EU was no rejection of the values we share. The decision to leave the EU represents no desire to become more distant to our friends and neighbours in the EU. It was no attempt to do harm to the EU itself or to any of its remaining Member States. Rather, the vote was driven by a desire to restore our own parliamentary democracy, national self-determination and to become even more global and internationalist in action and in spirit. We certainly do not want to turn the clock back to the days when Europe was less peaceful, less secure and less able to trade freely. So we will continue to be reliable partners, willing allies and close friends. We want to continue to trade with the EU as freely as possible, to cooperate to keep our countries and our citizens safe, to promote the values the UK and EU share – respect for human rights and dignity, democracy and the rule of law both within Europe and across the wider world, to support a strong European voice on the world stage, and to continue to encourage travel between the UK and the EU. The EU will continue to be, for many of its Member States, a key driver for positive change and reform. And this strong partnership between a sovereign UK and a thriving EU will be at the heart of a new global UK: a UK which will emerge from this period of change stronger, fairer, more united and more outward-looking than ever before. A UK which is secure, prosperous and tolerant – a magnet for international talent and a home to the pioneers and innovators who will shape the world ahead. A truly global UK – the best friend and neighbour to our European partners, but a country that reaches beyond the borders of Europe too. A country that goes out into the world to build relationships with old friends and new allies alike. A.1 Provision for the interpretation of, and resolution of disputes arising under international agreements is commonplace. These provisions vary in nature. This Annex provides a number of examples which illustrate how other international agreements approach interpretation and dispute resolution. Of course, these are simply examples of existing practices – the correct approach for the agreement underpinning the future relationship between the EU and the UK will be a matter for negotiation. A.2 CETA is a broad agreement that includes the elimination of tariffs in many areas, more open access to services markets and provisions for firms to bid for public contracts. The agreement establishes a ‘CETA Joint Committee’, covering both questions on trade and investment, and those on the implementation and application of the Agreement. The Joint Committee, which is made up of representatives from the EU and Canada, will have the power to adopt interpretation of provisions of CETA which are binding on tribunals, making its decisions by mutual consent. A.3 CETA provides for different tailored dispute settlement mechanisms depending on the identity of the parties or the subject matter of the dispute. Chapter 29 of CETA contains provisions for dispute settlement between the Parties to the Agreement.99 In the first instance, these are to be resolved by consultation and voluntary mediation. If this fails, the dispute can be referred to an arbitration panel, the ruling of which will be binding. The composition of the arbitration panel is to be agreed between the Parties. Where the Parties cannot agree on the exact composition of a panel, a pre-agreed list of at least fifteen arbitrators (five of whom will be Canadian nationals, five who will be nationals of the EU and five who will be nationals of third countries) will be used to select a panel which includes one national of an EU country, one national of Canada and one national of a third country who will act as chair of the panel. A.5 The arbitration panel will then present a confidential interim report. This interim report shall contain both findings of fact and determinations as to whether there have been any violations of CETA. The Parties can submit written comments on the interim report to the panel. At that stage the panel can decide to reconsider its report, further examine the issues or stick with its findings. A.6 The panel will then issue its final report to the CETA Joint Committee and to the Parties. This final panel report is binding. The responding Party will then have 20 days to inform the other Party and the CETA Joint Committee of its intention in respect of compliance. A.7 If the ‘losing’ Party fails to comply then the ‘winning’ Party shall be entitled to either suspend obligations or receive compensation. Obligations may only be suspended up to the level of the nullification and impairment caused by the original breach and, if the parties disagree over this, the matter can be referred to arbitral panel. These remedies are temporary only and are to be lifted when the losing Party takes the necessary measures to comply with the final panel report. A.8 Chapter 8 of CETA also makes provision for the settlement of investment disputes which arise under the Agreement. Chapter 8 confers a number of protections on investors and ‘covered investments’ covering matters such as compensation for losses, expropriation of property and national (i.e. non-discriminatory) treatment. In the event that a dispute arises, provision is made for consultations between the parties and for possible mediation. If a mutually satisfactory resolution is still not arrived at, the matter can be referred to an arbitral tribunal established under Chapter 8. Under CETA, 15 members of the tribunal will be appointed initially: five Canadian nationals, five EU nationals, and five third country nationals. This tribunal sits in panels of three (with one panellist from Canada, one from the EU and one from neither). An Appellate Tribunal is also established which can review tribunal awards. The Appellate Tribunal can modify or reverse awards of the Tribunal when, for instance, the tribunal made an error in applying or interpreting the law or a manifest error in its appreciation of the facts. Awards can take the form of monetary (but not punitive) damages or restitution of property. A.9 There are further chapter-specific mechanisms used to resolve disputes arising under Chapters 23 (trade and labour) and 24 (trade and environment). A.10 A large number of bilateral agreements govern the EU-Switzerland economic and trade relationship. A.11 Each agreement applies different elements of EU law to Switzerland. Some, like the agreement on the free movement of persons, apply substantive sections of EU law. Others, for example the free trade agreement, do not. A.12 Each of the principal agreements establishes its own ‘joint committee’. As with CETA, these joint committees are made up of representatives of the EU and Switzerland. In each instance, they have responsibility for managing the agreement, ensuring its proper application, and taking any steps required to implement the adjustments or revisions provided for in the agreement itself. A.13 All of the bilateral agreements are treaties, and hence give rise to binding commitments in international law. Should disputes under the principal agreements not be resolved by the relevant joint committee, the ultimate remedy would ordinarily be termination, and some of the agreements are linked, such that if one is terminated, so are others. With a few exceptions,there is usually no recourse to a court or tribunal. A.14 NAFTA has clear rules on dispute settlement. These mechanisms cover investment disputes (Chapter 11), the review of anti-dumping and countervailing duty determinations (Chapter 19) and the main dispute settlement procedure (Chapter 20). Under Chapter 20, in the first instance, the governments concerned aim to resolve any potential disputes amicably through NAFTA’s Committees and Working Groups or other consultations. If it is not possible to reach a mutually acceptable solution, then NAFTA provides for expeditious and effective panel procedures. Special procedures apply for matters such such as investment, financial services and the review of anti-dumping and countervailing duty determinations. A.15 Under the treaties establishing Mercosur, in the first instance, disputes are resolved by direct negotiations. If no agreement is reached during direct negotiations or if the dispute is only settled in part the parties can (by mutual agreement) submit the dispute to the Common Market Group (political representatives of member states) to issue a recommendation. Alternatively the parties may submit the dispute to the ad hoc arbitration tribunal. Decisions of the ad hoc tribunal may be appealed on a point of law to a Permanent Review Tribunal which can issue a decision, by majority agreement. Decisions of the Permanent Review Tribunal are final and are binding on the Parties. There is also a mechanism for disputes to be referred directly to the Permanent Review Tribunal by mutual agreement. A.16 The New Zealand-Korea Free Trade Agreement provides a mechanism for the resolution of disputes. The focus is on co-operation and consultation to reach a mutually satisfactory outcome. The Chapter on dispute settlement (Chapter 19 plus Annex 19-A) sets out a process for the establishment of an arbitration panel. The parties must comply with the findings and rulings of the panel. In the case of non-compliance, the complainant may be entitled to compensation or to suspend the benefits of the FTA. The parties may also agree alternative forms of dispute resolution, including through good offices, conciliation, mediation or even via the WTO process. A separate Chapter of the Agreement (Chapter 10) sets out the process to be followed in relation to investment disputes. A.17 Within the WTO, a dispute can arise when one country adopts a trade policy measure or takes action which another WTO member considers to be in breach of its WTO commitments. Settling disputes is the responsibility of the Dispute Settlement Body (DSB), which comprises all WTO members. A.18 The general approach on WTO disputes is as follows: the first stage is consultation, where countries in dispute see if they can settle differences themselves. The DSB has authority to establish a ‘panel’ to consider the merits of the particular dispute. Whilst technically a panel simply advises the DSB on its resolution of the dispute, in practice its conclusions are rarely overturned as this would require a negative consensus including the Party or Parties on the other (i.e. winning) side of the dispute; if the panel decides that the disputed trade measure does break a WTO agreement, it will recommend that the measure be brought into conformity with WTO rules, and its report becomes the ruling of the DSB unless it is rejected by a majority of WTO members. It is possible to appeal the report on a point of law. The DSB would set up an Appellate Body that can uphold, modify, or reverse the panel’s findings. The DSB must then accept or reject the appeal’s report – and rejection is only possible by consensus. A.19 The final ruling of the DSB must be complied with – if this does not happen within a ‘reasonable period’, the losing party must enter into negotiations with the complainant to determine mutually acceptable compensation. If no agreement on compensation is reached within 20 days, the complainant may ask the DSB for permission to retaliate. Retaliations are intended to be temporary and designed to encourage the other country to comply. A.20 In effect, this means that whilst decisions of the DSB create an obligation on the part of the losing party to comply with WTO rules, enforcement can be achieved by various means – including amicable settlement, compensation, or the suspension of trade concessions.101 Indeed, it was for this reason that the CJEU found in the case of Portugal v Council that a DSB decision did not oblige the losing party to achieve full implementation of its recommendations, where the possibility of temporary compensation or retaliatory measures remained available.102 In other words, the outcome was prescribed, but not the means.103 This contrasts with the position under EU law, where there is a right to an effective remedy from a judicial body. B.1 Ireland is our closest neighbour, and the only country with which the UK shares a land border. Our countries are intertwined through our shared history, culture and geography, and through our shared commitment to the Belfast Agreement, that provides the cornerstone to political stability in Northern Ireland. B.2 The UK Prime Minister and the Taoiseach have traditionally held an annual summit to take stock of progress and Permanent Secretaries and Secretaries-General from the UK and Ireland meet every autumn to discuss progress and maintain momentum. B.3 The Government is determined to protect and build on the strong historic ties between the UK and Ireland as the UK prepares to leave the EU. B.4 Nowhere in the UK is our relationship with Ireland more important than in Northern Ireland. B.6 The Government recognises that Northern Ireland’s particular circumstances present a range of particular challenges to be taken into account when preparing for our exit from the EU. We are committed to making a success of exit for the whole of the UK, including Northern Ireland, and to working with the Northern Ireland Executive to ensure that Northern Ireland’s particular circumstances are factored into our wider preparations. B.7 Since well before the establishment of the EU, Irish citizens have had a special status within the UK, rooted in the Ireland Act 1949 and reflected in the British Nationality Acts. This status provides Irish citizens in the UK with additional rights beyond those associated with common membership of the EU. Similar reciprocal arrangements exist for British citizens within Ireland. In addition, the Belfast Agreement confirmed the right of the people of Northern Ireland to identify as British, or Irish, or both; to hold citizenship accordingly; and to equal treatment irrespective of their chosen identity. B.8 The Government remains firmly committed to the Belfast Agreement and recognises the importance of maintaining the special status of Irish citizens within the UK. As we have explained in Chapter 4, we will protect this reciprocal treatment once the UK has left the EU. B.9 The Common Travel Area (CTA) has provided free movement of people between the UK and Ireland (and the Channel Islands and the Isle of Man) for nearly a century. Originally an administrative arrangement, it is now reflected in each state’s application of national immigration policy. B.10 We value the flexibility that the CTA provides for free movement of people between these islands. This is particularly important in Northern Ireland, where communities are linked across the land border with Ireland. As explained in Chapter 4, we want to protect the ability to move freely between the UK and Ireland – North-South and East-West, recognising the special importance of this to people in their daily lives, particularly on the island of Ireland. B.13 The Single Electricity Market operating on the island of Ireland provides both Ireland and Northern Ireland with affordable, sustainable and secure access to electricity for both businesses and domestic customers. The former First and deputy First Ministers of Northern Ireland highlighted this as an important priority for Northern Ireland and this Government recognises the importance of ensuring that it is secured following our departure from the EU. B.14 As Chapter 8 makes clear, we want to ensure that cross-border trade with the EU – and particularly with Ireland – is as frictionless as possible when we leave the EU. We are committed to negotiating an exit deal that works for the whole of the UK, including Northern Ireland. We will work with the Irish Government and the Northern Ireland Executive to minimise frictions and administrative burdens and to find a practical solution that keeps the border as seamless and frictionless as possible, recognising the unique economic, social and political context of the land border between Northern Ireland and Ireland. B.15 Chapter 11 highlights the importance this Government places on maintaining strong cooperation with our European partners in the fight against crime and terrorism. We recognise the particular significance of this in Northern Ireland. The major reviews of policing and justice that followed the Belfast Agreement recommended a strengthening of cooperation between law enforcement and criminal and civil justice agencies.110 Today’s effective cooperation and coordination between the justice and security agencies in Northern Ireland and Ireland are essential in containing the threat from paramilitary groups, whose objective is to threaten Northern Ireland’s security and to undermine political stability there. This operational and practical cross-border cooperation exemplifies the sort of relationship we want to have with the EU post-exit.